The terrestrial reptiles of the Triassic, Jurassic and Cretaceous periods (Chapters 6 and 8) were mainly diapsids, with a few anapsids, essentially the turtles, and their cladistic relationships (see cladogram) are clear in broad outline. The turtles and tortoises, Testudines, form a well-characterized clade that is part of the larger clade Anapsida (see Box 5.1). Within Testudines, the Late Triassic and Early Jurassic forms, Proganochelyidae and Australochelidae, are outgroups to the Casichelydia, consisting of Pleurodira and Cryptodira, all subsequent turtles (Gaffney and Meylan, 1988; Gaffney, 1994). The Diapsida includes the Ichthyosauria, and then it divides into two major clades (Benton, 1985; Laurin, 1991; Dilkes, 1998; Rieppel, 1998), Lepidosauromorpha and Archosauromorpha, which diverged in the Permian, and both of which radiated in the Triassic (see Figure 6.6). Lepidosauromorphs may include the Sauropterygia, two groups of marine reptiles that probably independently lost the lower temporal fenestra (Rieppel, 1998). The main lepidosauromorph clade, the Lepidosauria, includes the sphenodontians and the squamates, five 'lizard' clades plus the snakes (Estes et al., 1988; Caldwell, 1999; Lee and Scanlon, 2002). The relationships of snakes (Serpentes) are unclear, i.e. whether a sister group of Amphisbaenia or Anguimorpha (see Box 8.10). The main archosauromorph clade of the Mesozoic and Cenozoic, the archosaurs, split in the Triassic into a line that led to crocodiles, and another, the Ornithodira, that led to pterosaurs, dinosaurs and birds (see Box 6.1). The Crocodylomorpha includes some basal forms, the Saltoposuchidae and Sphenosuchidae, from the Late Triassic and Early Jurassic, and the Crocodylia, which arose in the Early Jurassic. The Crocodylia (Benton and Clark, 1988; Clark and Norell, 1992) are divided into a number of Jurassic and Cretaceous families that are outgroups to the Eusuchia, the clade containing modern crocodiles, alligators and gavials, and which arose in the Early to Mid-Cretaceous. Cladogram showing the postulated phylogenetic relationships of the main groups of non-synapsid reptiles. Synapomorphles: A EUREPTILIA, maxilla separated from quadratojugal by jugal, tabular small or absent, parasphenoid wings absent, supraoccipital narrow in posterior view, large post-temporal fenestra, suborbital foramen in palate, single coronoid, femoral shaft long and slender, single centrale in ankle; B TESTUDINES, lacrimal small or absent, postfrontal absent, quadrate concave posteriorly and exposed laterally on cheek, postparietals absent, stapes solid and rod-like, maxilla, premaxilla and dentary lack teeth, bony shell consisting of a carapace and plastron; C, fusion of the braincase and palate, partial enclosure of the middle ear region laterally; D CASICHELYDIA, lacrimal foramen absent, vomer single, interpterygoid vacuity small or absent, middle ear region enclosed ventrally; E DIAPSIDA, upper and lower temporal fenestrae, suborbital fenestra, ossified sternum, complex tibio-astragalar joint, first metatarsal less than half the length of the fourth metatarsal; F, lacrimal reduced, caniniform maxillary teeth absent, quadratojugal reduced; G LEPIDOSAUROMORPHA, postparietal absent, prominent lateral conch on quadrate for support of tympanum, retroarticular process large and formed entirely from prearticular bone, interclavicle gracile with slender lateral processes, ossified sternum, ectepicondylar foramen in humerus, pelvic girdle fenestrate; H LEPIDOSAURIA, lacrimal reduced or absent, postparietal and tabular absent, thyroid fenestra (between pubis and ischium), fused astragalus and calcaneum, loss of centrale, loss of distal tarsals 1 and 5, metatarsal 5 hooked in two planes; I SQUAMATA, high degree of skull kinesis, premaxillae fused, nasals reduced, squamosal reduced or absent, parietals fused, quadratojugal absent, lower temporal bar absent, posterior conch-like notch on quadrate, proatlas absent, ribs single-headed, gastralia absent; J SCLEROGLOSSA, vomer elongate, more than 26 presacral vertebrae; K, no contact between nasal and prefrontal; L AUTARCHOGLOSSA, no contact between jugal and squamosal; M ARCHOSAURIA, antorbital fenestra in snout wall between nostril and orbit, laterally flattened teeth with serrations, ossified laterosphenoid in braincase, lateral mandibular foramen in posterior lower jaw bones; N ORNITHODIRA, presacral centrum 8 longer than presacral centrum 18, deltopectoral crest on humerus subrectangular, fibula tapering and calcaneum reduced in size, astragalar posterior groove and calcaneal tuber rudimentary or absent; O CROCODYLOMORPHA, maxillae enter secondary palate, squamosal broadly overhangs quadrate laterally, postfrontal absent, primary contact of quadrate head with prootic, quadratojugal contacts postorbital, pneumatic basisphenoid and prootic, proximal carpals elongate; P, antorbital fenestra small, parietals fused; Q CROCODYLIA, basisphenoid rostrum dorsoventrally expanded, basipterygoid processes reduced, lower portion of coracoid expanded and anterior margin concave, scapula very broad dorsally; R MESOEUCROCODYLIA, secondary palate formed from maxillae and palatines, 'skull table' with nearly flat dorsal surface, two large palpebrals, dorsal head of quadrate contacts laterosphenoid, quadrate hollow and equipped with fenestrae in dorsal surface; S METASUCHIA, pterygoid strongly sutured to quadrate, maxilla with single wave of enlarged teeth, anterior process of ilium nearly absent; T, quadratojugal narrows dorsally, single palpebral ossification, premaxillary teeth uniform in shape; U NEOSUCHIA, maxilla subvertical, antorbital fenestra absent, retroarticular process narrow, maxilla and dentary with two sinusoidal waves of teeth; V, rostrum nearly tubular, basioccipital with large pendulous tubera, retroarticular process posterodorsally curving and elongate, splenial involved extensively in symphysis; W, inset postorbital bar, biconvex first caudal vertebra, osteoderms in more than two longitudinal rows. America, disputed the top carnivore niches with birds and mammals. This extraordinary history is based around a conservative body design. Crocodilians have long snouts with the nostrils at the tip (Figure 8.29(a,b)) so that they can breathe with only the nostril bump showing above water. 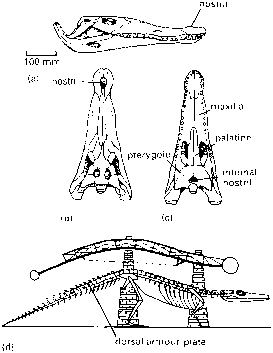 There is a secondary palate formed from ingrowths of the maxillae and palatines and, in derived forms, the pterygoids also (Figure 8.29(c)), which separates the air stream from the mouth cavity and allows the crocodilian to breathe with its mouth open underwater while feeding (Iordansky, 1973).Crocodilians typically seize antelope and other mammals by a leg and drag them underwater until they drown, and then tear off chunks of flesh by sinking their sharp teeth well into the flanks and twisting with the whole body. In this way they are able to achieve much greater force for tearing at the meat than by simply twisting their heads from side to side (Taylor, 1987). 4 galloping, the most unexpected mode, in which the forelimbs and hindlimbs act in pairs. The skeleton of crocodilians does not seem to be well adapted for this last mode, galloping. Nevertheless, crocodilian backbones are braced in a manner analogous to a box-girder bridge (Frey, 1984). There is a double row of dorsal bony scutes in the skin that adhere closely to the backbone, and the vertebral column is braced by longitudinal muscle systems that attach to the dorsal armour over the back and tail (Figure 8.29(d)). The first crocodilomorphs such as Saltoposuchus from the Late Triassic (see p. 145) were lightly built and probably bipedal. The sphenosuchid Sphenosuchus from the Early Jurassic (see pp. 145-6) was more crocodilian in appearance. The first true crocodilians, protosuchids such as Protosuchus (Colbert and Mook, 1951) and Orthosuchus,appeared in the Early Jurassic. These small 1-m long animals were quadrupedal (Figure 8.30(a)), but the hindlimbs are longer than the forelimbs, betraying their bipedal ancestry. The protosuchids display a variety of crocodilian synapomorphies. The skull is ornamented with irregular pits in the bone surface (Figure 8.30(b)), as in modern crocodilians, and the posterior part of the skull roof is square in outline because of the great overhang of the squamosals on either side. The squamosal bears a specialized ridge to which a fleshy 'ear lid' attached in life, a device to keep out the water during diving. 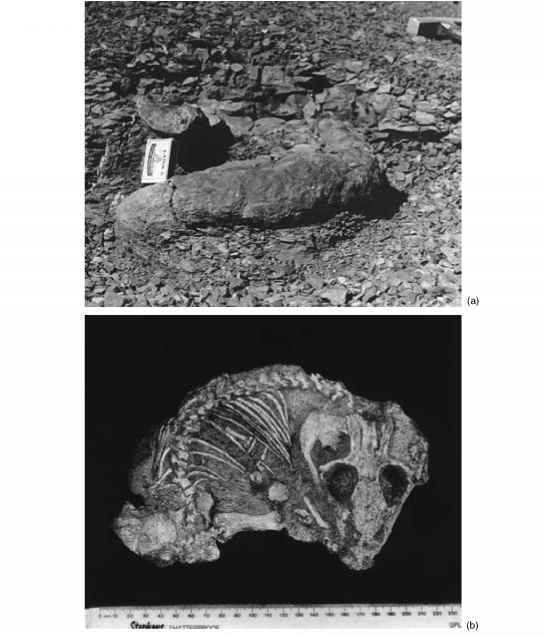 There are additional palpebral bones in the eye socket, an independent evolution of bones also seen in some ornithischian dinosaurs (see p. 205). The whole posterior region of the skull is pneumatic,with complex air passages whose function is not clear. Protosuchus shows crocodilian characters in the skeleton as well: an elongate 'waisted' coracoid (Figure 8.30(c)), a perforated acetabulum and reduced pubis (Figure 8.30(d)), elongate wrist elements and extensive armour covering. Protosuchus probably fed mainly on small terrestrial animals. In the classification of the 150 or so genera of fossil croc-odilians, most of those of the Jurassic and Cretaceous were classically placed in a group called the 'Meso-suchia', mainly aquatic forms that lack the specializations of the living groups, the Eusuchia. The 'Mesosuchia' is, however, a paraphyletic group containing a great diversity offorms (Buffetaut, 1982),and it is more correctly united with the Eusuchia in a clade Mesoeucrocodylia (Benton and Clark, 1988; see also Box 8.8). dilians that are best known from the Jurassic. The ste-neosaurids of the Early and Middle Jurassic had long narrow snouts, and they hunted fishes in shallow seas and estuaries around Europe in particular. The metri-orhynchids, such as Geosaurus from the Upper Jurassic of Europe (Figure 8.30(e, f)), were heavily modified for a wholly aquatic existence and for swimming by powerful undulations of the body. The caudal vertebrae bend down to support a tail fin, the limbs are paddle-like and the body armour is lost, which would improve the hydrodynamic efficiency of the body. It is likely that the metriorhynchids had difficulty in walking on land. These crocodilians may have hunted cephalopods and fishes by sudden accelerations through the water. 1m long, has differentiated teeth. The pointed teeth at the front may have been used in seizing prey and the flatter 'cheek teeth' for cutting up the flesh. One noto-suchid from the Lower Cretaceous of China, Chimaera-suchus,may even have been a herbivore. 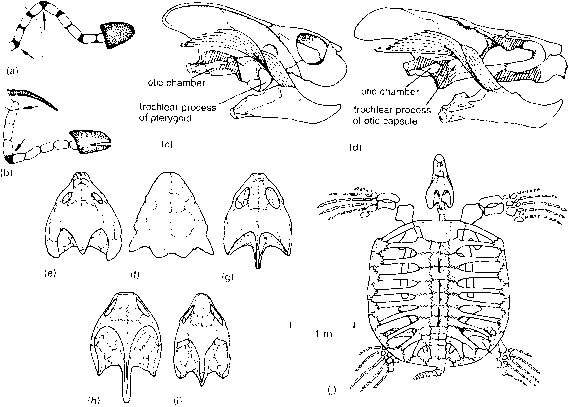 The Sebecidae, known from the Palaeocene to Miocene (60-10Myr ago) of South America have large skulls (Figure 8.30(h)) with a high snout, no antorbital fenestra and unusual flattened teeth. The sebecids were successful carnivores that probably preyed on mammals, but they were eventually replaced by mammalian carnivores in the later Tertiary. More derived crocodilians,the neosuchians, include some long-snouted aquatic forms, such as the gonio-pholidids, abundant in freshwater and marine deposits from the Middle Jurassic to the end of the Cretaceous, the dyrosaurids from the Early Cretaceous to late Eocene (including some giant forms, see Box 8.9) and the Eusuchia. Bernissartia and Hylaeochampsa from the Lower Cretaceous of Europe (Clark and Norell, 1992) are similar to Eusuchia in many ways, sharing with them an inset postorbital bar, a biconvex first caudal vertebra (that is, both articular faces are ball-like) and osteo-derms (bony scutes) arranged in more than two longitudinal rows along the body. The Eusuchia (literally 'true crocodilians') appeared in the Late Cretaceous and most of the early representatives are very like modern forms. The group is distinguished from basal crocodilians by a full secondary palate formed from the maxillae, palatines and pterygoids (Figure 8.29(c)), and some other skull features. Modern crocodilians are divided into three families, consisting of the crocodiles, alligators and gavials (Brochu, 2003b).The first two families are known from the Late Cretaceous and all through the Tertiary, when they were much more widespread than they are now, with dozens ofspecies reported from Europe and North America as far north as Sweden and Canada, as well as all tropical regions and southern continents. Gavials, more fully aquatic forms with long narrow fish-eating snouts, date back to the Eocene. 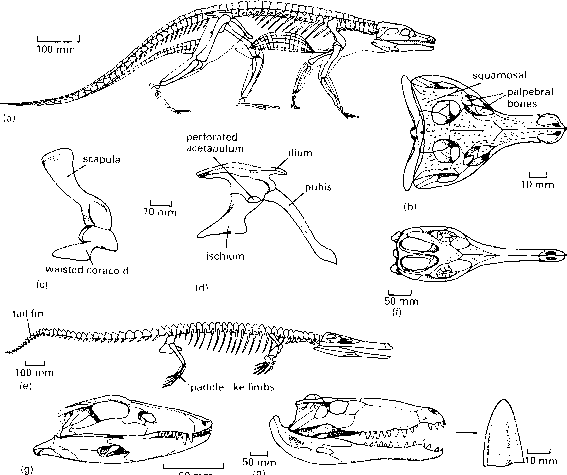 Several other euschian families are known only from fossils, some with massive broad ducks'bill-shaped skulls and others with serrated dinosaur-like teeth. The present array of crocodilians is a much reduced representation of their former glory.